I thought I would share the view from my bathroom. I was fully dressed when I took this photograph – it is a bit fuzzy because I was trying to zoom in on the flax fields. Yes, I sometimes sit in my bath and pretend these are fields of lavender and that I’m in France. A Bathroom with a view…. And here is another picture of a book on a chair seeing as the book on the chair in my previous post proved so popular. I have decided that ‘A book on a chair’ is my new thing. 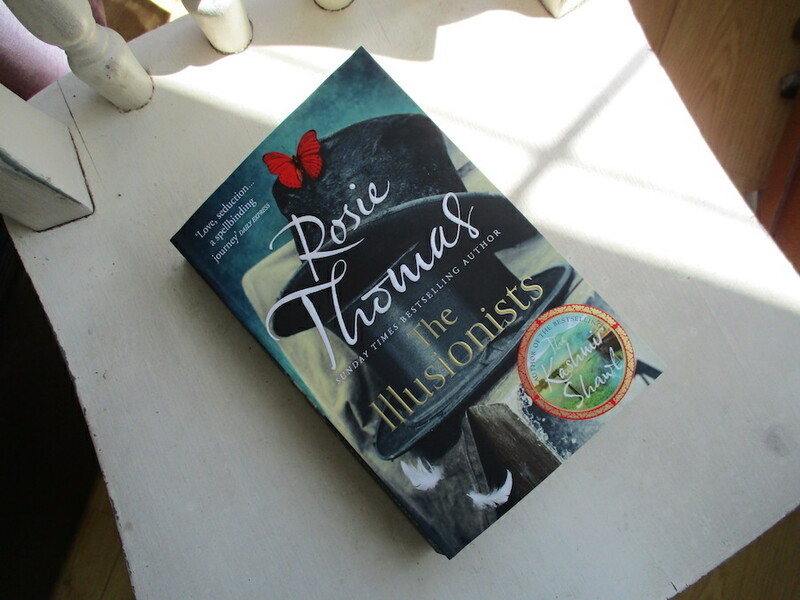 This is The Illusionists by Rosie Thomas – a jolly romp through Victorian London theatre land. As I’m reading I am envisioning Clark Gable in the lead role alongside Warwick Davis and Jenna Coleman, plus my envisioning is in black and white and was made in 1939. I am on page 284 (of 513) and the obligatory reference to Jack the Ripper has just turned up. Meanwhile, I have finished this. I am not happy with it. It is suffering from Kolner Miniatum pucker…. meaning the surface of the gold is wrinkly; this is probably because I applied the miniatum too thickly – or because I didn’t breathe on it correctly and therefore introduced unnecessary moisture to the surface before applying the leaf. Ack. This is a fuzzy photo to deliberately disguise my shortcomings. I am happy with this though…. Until next time when I will have another book on a chair. This entry was posted in Calligraphy, Creative Writing and tagged addressed envelope, book review, calligraphy, gilding, Rosie Thomas, The Illusionists on May 30, 2016 by Scarlet. God gods, it’s hideous! Remove that Kolner Miniatum pucker from my sight immediately! What an offense. Just kidding! I think it looks lovely, fuzzy or otherwise. Although, it could be improved by being photographed on a chair like the books. And is that the same chair as last time, or another in the set? Is Warwick Davis’s moustache the star of the novel? Yes, I know, this is a lazy old post isn’t it? I am feeling lazy. WE HAVE SUN HERE!!!! And I have been sitting in it…. thus not only are my pictures fuzzy, but so is my head. I must be the only person who likes the look of a well turned turbine…. but these are as close as I like them, and I do worry about the birds. Good idea! From now on I will put everything on this chair for my photographs, and rename my blog: Everything on a Chair. Sun? SUN!?! We had some on Saturday, but ever since Saturday evening it’s been getting colder, cloudier and extremely windy. I do like a nice wind turbine, too. We have some off the coast but can barely see them. However, there are two in the outskirts of Swaffham which, when I see them on the way back from visiting Indescribable and the Babyzillas, give me a little bit of joy as I know I’m more than half-way home. Oh, I’ll bring a bottle of champagne to smash across the bow of your renamed blog! Those are not very short comings! So beautiful! Every time I see your script close up, my mind gets more boggled. This gilding phase is driving me crazy, Amy! But, I think I now have a solution – we shall find out in my next post – exciting times! 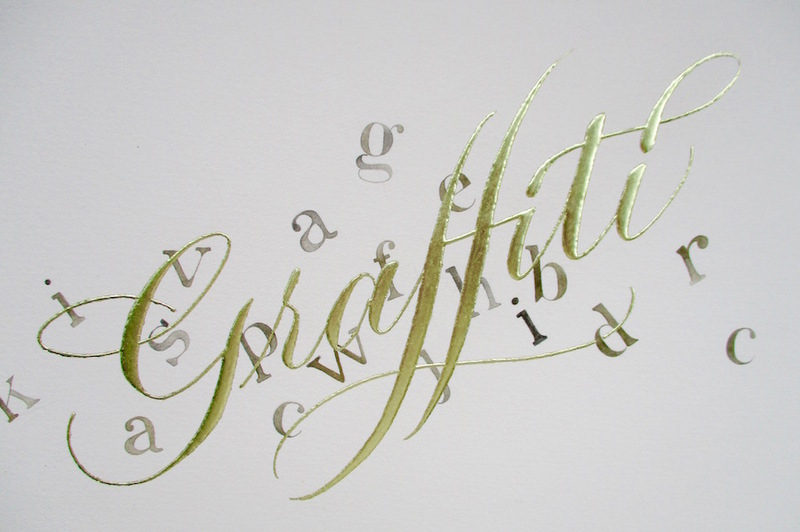 Ack, I probably couldn’t do proper copperplate if I tried… too much temptation to sling a ‘g’ around! Fax fields? Wind turbines? Sunshine? Lor’! Devon has changed since I was there. I feel like a traveller in a foreign-yet-familiar land. Oh wait…I think I am. I’d love to have the sort of bathroom where I could squint at fields and dream. My bathroom’s view is straight to the front door. Bit of a worry if the missionaries come knocking! Well normal service has resumed in Devon, Dinah, i.e. it is now cold wet and miserable. Do you have glass in your front door? 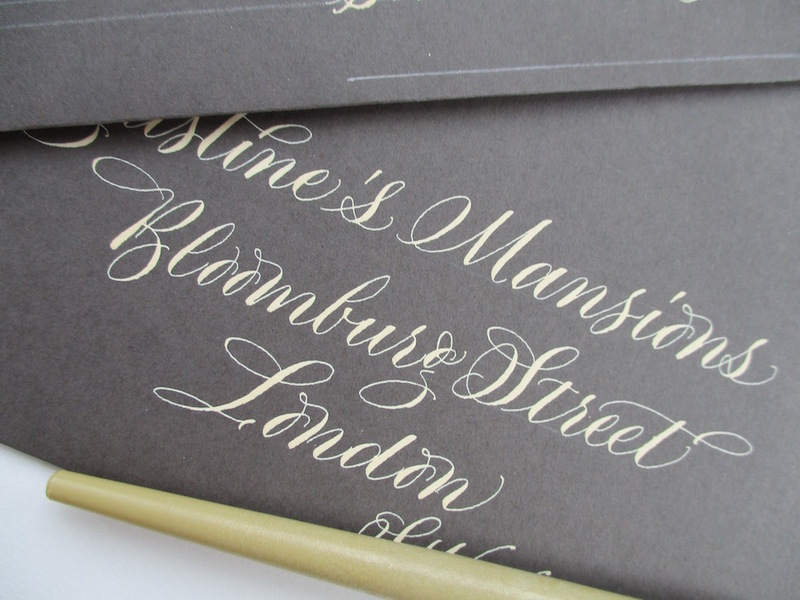 The golden letters flow effortlessly & are stunning in the address. What marvelous work! I do like the golden letters floating like a butterfly among the other letters looking like blooming flowers. I can only see the marvelous results of your talented efforts, so thanks for sharing your wonderful works with us. I, too, like the book in the chair picture. It’s a very novel & interesting way to showcase the books, & the chair does look lovely & comfortable, homey. 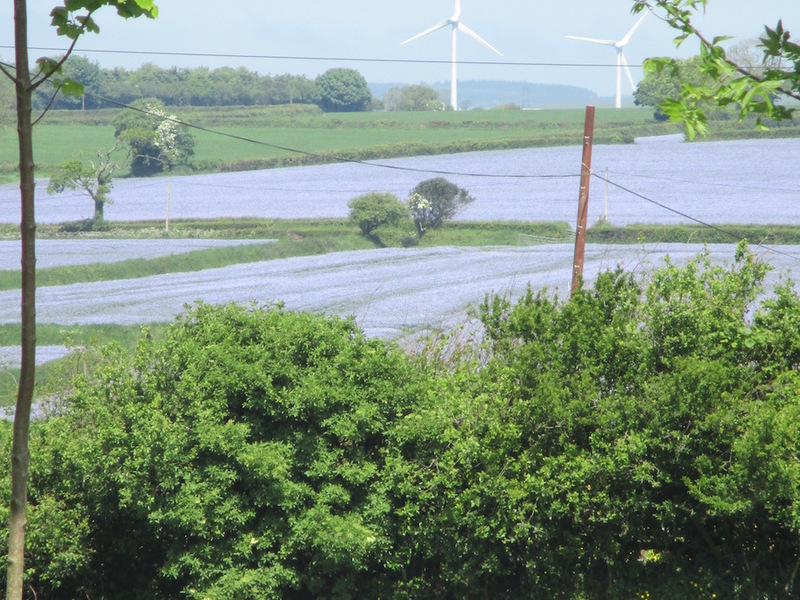 You have a gorgeous view of beautiful flowers & fields & wonderful turbines. I like looking at these modern day windmills. They do remind me of modern art pieces. And they produce clean energy! I wouldn’t mind hanging out in the bathroom if I had such a spectacular view. I’m glad you get to enjoy that view & the sunshine. The “A book on a chair” concept has won me over. I knew it would, Ms Mistress!!! Thank you. It is definitely the same chair, I recognize the crack in the left upper corner. Silly me thought at the first glance at your out-of-bathroom-view that you have also a little flood-problem in Devon ? We do not have blue fields here, yellow ones, yes, but not blue. Despite this it looks familiar, where are the wineyards, please ? I think your gilded graffiti looks nice, do not be over critical. On the other hand I am artisanally challenged with all these thumbs on my left hands … couldn’t you just steal something from the web and print it on a laser, and stop poking my with that quill please …, ey ! – ! – !! Wineyards, Mr Mags?!! I wish. No Wineyards here…. there is a Gnome Reserve, and a cheese factory…. but sadly no wine. Meanwhile, I am in the process of emblazoning a flourished arse on the chair to emphasise the crack. I am thinking of Van Gogh’s windmills. Sorry. No need to apologise, Mr Lax! I like a windy miller. Apologies, I didn’t realise I had left all the comments here without replying. I find fields of blue enchanting – forget gold! My favourite in Cephalonia – not sure what the plant is . Flax? This is flax, Pat. All gone now….as is the sun. Miserable, isn’t it? You could change the angle of the photo or use a different type of chair, the idea is a goldmine of exciting variations! This is why I live in the middle of nowhere with wind turbines, I got fed up with unneighbourly neighbours. “Jack the Ripper has just turned up” – oh that can’t be good unless you sell cement and heavy chains. Oh wait I might have just mixed up serial killers. Was it Mack the Knife dropping bodies in the river? Damn I’ve gone and confused myself again. Was Mack the Knife written about Jack the Ripper? I knew Jake the pipe-fitter. He was a fast pipe-fitter. Good heavens, Bill! Too many serial killers spoil the broth… or was that cooks? I had a New Zealand flax growing at my last house. Stonking views, despite the ghastly wind turbines. You could write ‘ Park your arse here’ on the chair in that lovely script of yours to cheer it up a bit. You mentioned sun, is it that orange globe thing in the sky? Dearest Mitzi, the sun has now vanished, the glorious fields of flax are no more…. the turbines invisible in the mizzle. BUT, I am working on Park Your Arse! And you are right, my rendition of a well flourished arse has cheered me immensely. Oh, they’re flax fields, I thought for a moment they were huge solar-panel grids! A book on a chair – a classic concept with lots of potential. You could add a note saying “This is not a book”. Or a note saying “The book has been moved”. Or a note saying “Page 73 is better than page 97”. Tsk. I am not a fan of solar panel fields, but I like looking at the turbines. I will consider your ideas for the book/chair project. Thank you for your input, Nick. I am strangely calmed by those turbines; you can’t see them on a grey day, they blend in. Always good to see you, Savvy. I am sulking. Someone has stolen THE chair. Ran off with the FGES? Who did? What is going on?? Did I miss something?? There goes our favourite crack … but perhaps it is just misplaced ? Tsk….. I found the chair!!!! It was buried under a pile of unread books. Silly me. I think they are replacing Bake Off with a rather unsavoury show called Sod Off. It will be about turf and wars. I shall not be watching. Thank you for your inquiry, Mr Lax, I shall, of course, keep you updated regarding all things that have gone off. I think “Sod Off” is a new show produced in Brussels. The directors of Junkers Tusk & associates seem to be pretty pissed off lately. Everything is off, Mr Mags!!! Even the fish fingers!! It is hideous. Do you think Juncker will resign, Mr Mags? The plot thickens! Everyone is indeed off!! Hey hope things are still ok. That brexit crap sure made us go to google maps to find the UK. Having been there I remember where it was. I can’t believe that idiot Trump found his way to Scotland. I guess he pays his pilots to know the way. Now that our dollar vs. your pound is more favorable (favourable I never know when to throw a ‘u’) there might more of us coming over for tea and biscuits. (actually most will probably stick with Starbucks) I just thought I should warn you. Ha Ha Ha!!! I think Trump upset Scotland…. and they were already in a bit of a mood. It’s all been a nightmare. I will have a Devon cream ready for your arrival, Bill, please bring plenty of dollars!